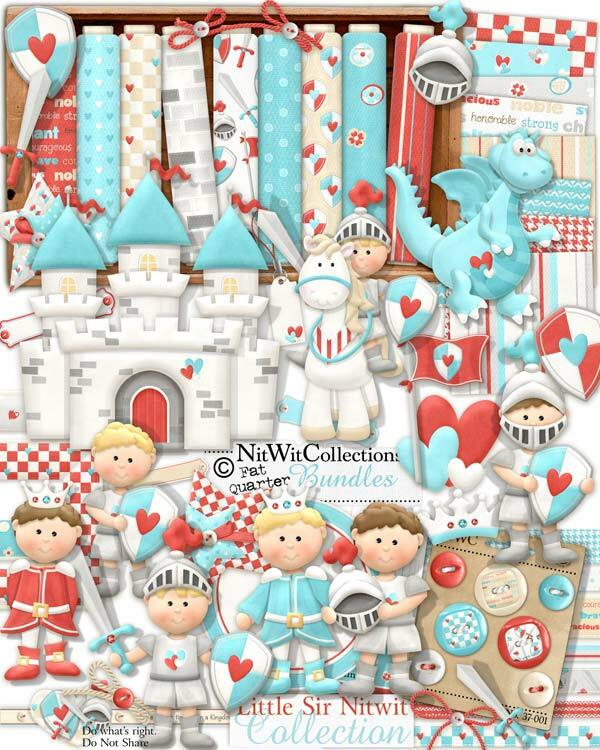 "Little Sir Nitwit" Collection is a brave new Collection that was created with the heart of a Knight! All of the necessary traits are here to make your prince proud (and your other family members), so we hope that you will take on this creative quest to let out a shout at your computer, and begin your inspired journey! If you are looking for a princess for your story, please check out our FQB "Fairytale Dreams" Collection. 7 Buttons - for tunics, and under armour, etc. 1 Crown - 1 head, 1 crown....makes sense, no? 1 Dragon - here to help you possibly? 1 Flag - plant it on your creation to stake your claim! 7 Ribbons - you'll need lots for the jubilant return! 5 Strings in differing styles and colours - ahhhh the days before velcro!